When she says the three words, you may struggle with a response. If a loved one or friend hasn’t informed you of a cancer diagnosis, it’s only a matter of time until they will. Every year fourteen million people worldwide learn they are living with or may die from this insidious illness. The uncertainty of cancer causes anxiety in those diagnosed and feelings of inadequacy in loved ones and friends who want to help. When someone says “I have cancer,” what will you say? More importantly, what will you do? 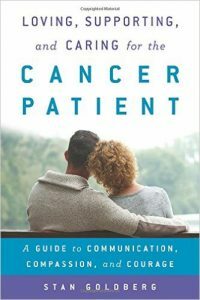 In Loving, Supporting, and Caring for the Cancer Patient, readers will learn specific ways of going beyond the response “I’m so sorry,” and practical behaviors that will ease a loved one or friend’s journey. They range from being specific immediately after a diagnosis, to honoring their loved one or friend at the moment of passing.